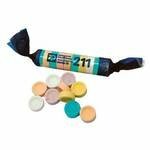 Our promotional sweets collection is packed with a wide range of confectionery items to promote your business or organisation. 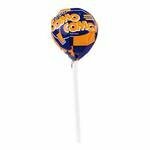 Our most popular products are Lollipops, Bags, Retro, Traditional Fudge, Fruit Atomz, Sugar Free, Jellies and Pastilles. 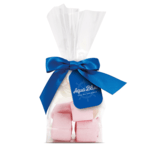 Personalised sweets are perfect for trade shows, product launches, universities, corporate dinners or conferences. 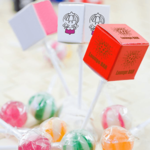 Branded sweets and confectionery are great giveaways and can be used at many types of private and corporate events as giveaways and reminders of the event and your brand. Click on the any of the confectionery shown below to see further details, personalisation options and pricing. If you are interested in bespoke confectionery for your marketing campaign and promotion let us know. The term confectionery is one that refers to both chocolates and sweets. 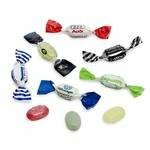 In the promotional industry, the term promotional confectionery refers to chocolates and sweets that have been personalised with a specific imprint for a company or organisation. The imprint can include a logo, website and other contact details or a marketing slogan. 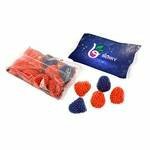 What has made promotional confectionery more affordable and within easy budget reach for many marketing managers is printing technology. Whilst sweets do have to be made in volume to meet a cost-effective unit price, digital print technologies have made branding easier allowing smaller manufacturing runs of personalised packaging, wrapper and containers. 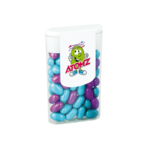 As well as personalising the confectionery it is also worth considering how to brand your dispensers and containers. 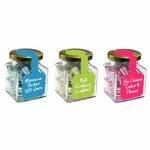 If you use confectionery at exhibition giveaways then use a clear bowl or jar to display the goods as this will allowing the branding to be seen. 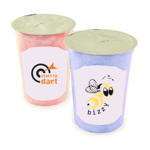 If you cannot use a clear container it is important to think about a personalised dispenser. 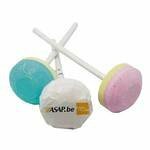 This will provide two functions with the first being to display your logo and the second to act as an efficient confectionery dispenser. 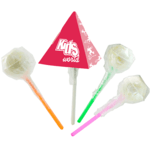 See the promotional confectionery ideas and fillings available from Redbows. 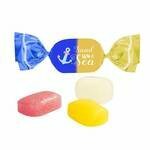 Promotional confectionery is very popular in the corporate world where it may be referred to as corporate sweets and is often used to promote brands. 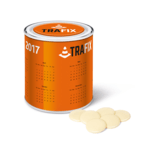 The promotions may be for specific events such as seminars, exhibitions or tradeshows or more general where the confectionery is placed in meeting room bowls and jars for visitors and attendees. 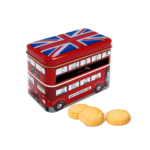 Each of the confectionery items we supply can be personalised. 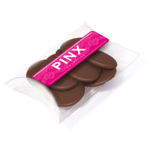 The most common way is to apply your imprint to the outside of the confectionery wrapper or box or container. For this we will need your artwork in a vector type format file. If you cannot provide this then our design studio may be able to create this; just send over what you can. If we do need to redraw your logo to generate your artwork there may be a charge for this service. Personalisation doesn’t just stop with the wrappers, boxes and containers. If you would like us to put a personalised message inside the delivery boxes just let us know. 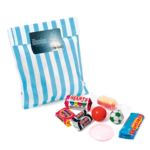 We can also bundle confectionery items together as well as other promotional products to provide complete product packs for your marketing campaign. If you need these then delivering to different addresses or venues we can also arrange this through our fulfillment team. 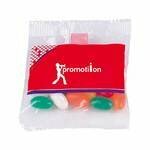 If you cannot find the confectionery you need for your promotion in this collection, please do contact us. Let us know exactly what you are looking for and we will be able to source this for you from our supply chain of UK and European confectionery manufacturers. What would you recommend for a Summer Marketing Campaign? 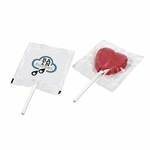 For a summer marketing campaign, we recommend Candy Floss, Flying Saucers, Twist Marshmallows, Flat or Heart Shaped Lollipops or Traditional Fudge, from the personalised sweets collection. 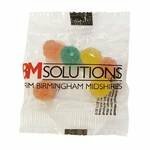 Our standard best sellers are Single Twist Sweets or Large Pouches with a filling of your choice. 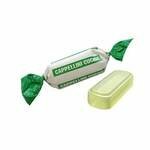 We offer a wide variety of corporate sweets for all occasions. 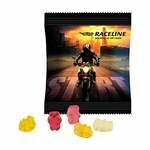 What are your custom made gummy packs? 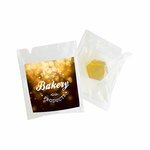 Our custom made gummy packs are designed by you. Select from standard shapes or create one entirely unique to your company. This can be your logo, a new product or service. Ideal for promoting product launches or specialised businesses. 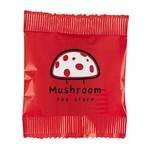 The confectionery is supplied in a small bag with a full colour label. What sweets products to send out in January? Everyone is looking for a little pick me up in January, whether it’s a bar of chocolate or a packet of sweets branded with your logo. We have a wide variety of items in our snacks collection that are perfect for the colder months. We offer branded porridge sachets, cereal bars, breakfast biscuits and soup sachets. 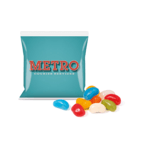 The sachets are a great choice for mailer campaigns as they fit easily into an envelope.